First off, and I may have to state this again; this discovery (@ GUTH Venus) is simply not "rocket science" nor is this even all that much geography, archaeology, anthropology or any other "ology" of chemical analysis, physics or even that of a recognized science as such. 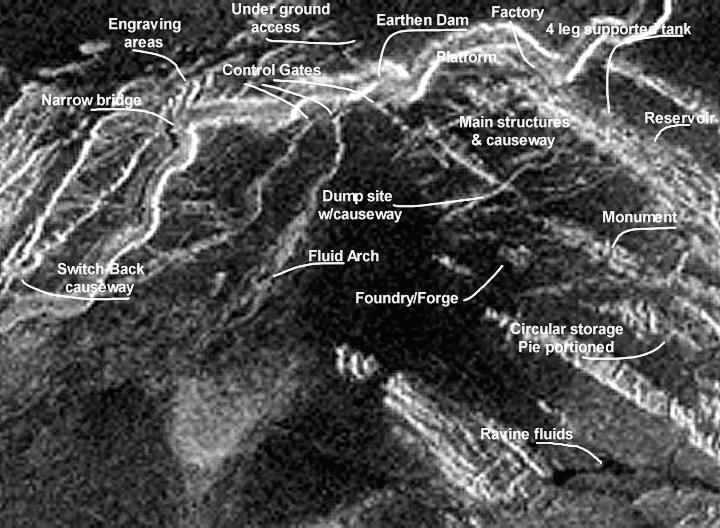 Looking out the dam window of an airplane as such (via Magellan's radar imaging), and being capable of recognizing obvious structural features having apparent highly complex infrastructure is more like being "conscious". 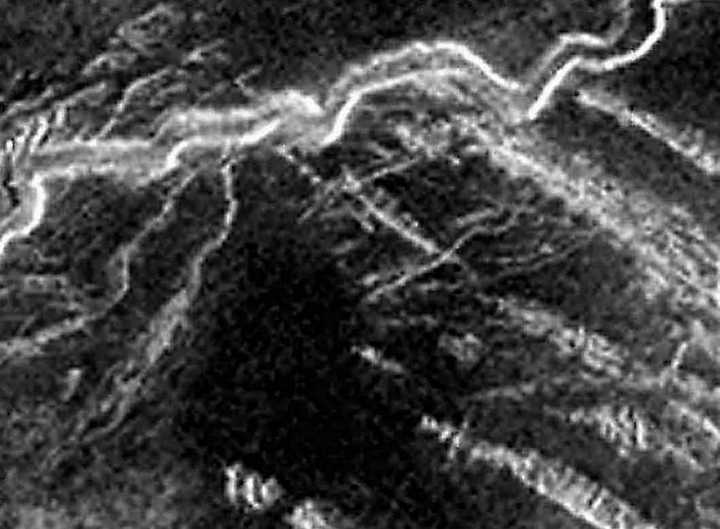 This discovery is simply so real, so how about letting everyone (including NASA) face a few too many facts regarding what clearly can be identified (in spite of the relatively poor yet obviously sufficient resolution) at this location on Venus. This is a truly remarkable discovery which I have been so willing to share with the world (sorry, if this is no longer how NASA works anymore, as I first tried it their way and quickly got nowhere). Others, as well as I, have been able to point out far too many viable discovery issues, and I believe we can recognize their most likely utilizations, as well as their most probable life supporting requirements being further fulfilled by the very nature and arrangement of these structures and infrastructure, all of which I alone have made relatively easy to identify. Now, I could be wrong, with regard to some of these structural functions and utilizations, however, I feel my conclusions are obviously far superior to NASA's limited point of view (outright denial). I guess the proven "hear no evil""see no evil" pretty much sums up NASA's methodology of willfully ignoring the facts and continuing to base their standards depending upon their crack teams of braille image interpreters. 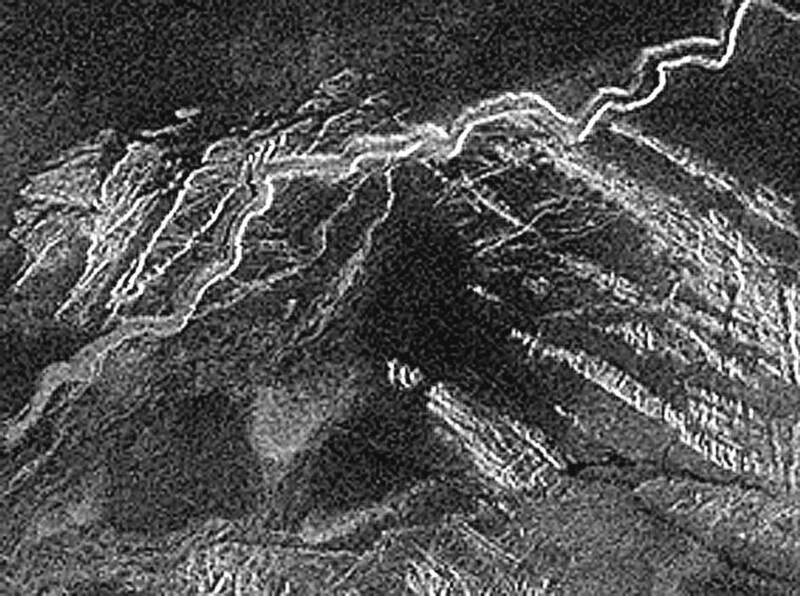 NASA is simply no longer playing with a full deck (perhaps not for the last 10 or 20 years), especially when they state; what others and I see is merely that of common lava-flow channels, rock and erosion, and furthermore, exactly like most any other areas of Venus. 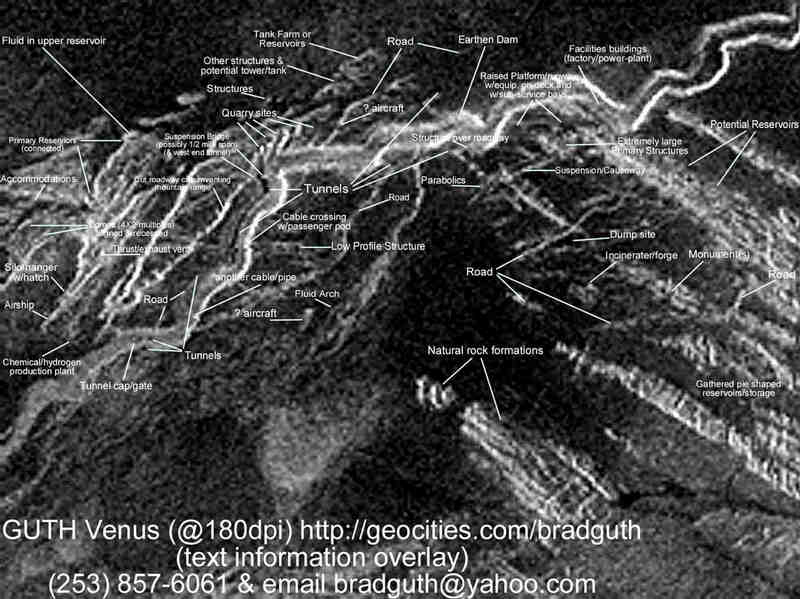 Sorry guys, but that simply is not even close to the obvious facts, and to effectively prove this out, NASA itself has been unable to support their own denial claims, by not being capable of showing any such other common areas of Venus or for that matter from any other planet (including Earth) as depicting anything remotely close as so called naturally occurring formations resembling such a collection structures. Trust me on this, I have looked hard and long for just this sort of detail, as in searching for another similar collection of intelligently shaped and arranged structures, because, as I have made clear in several of my previous documents, I do believe another (a second) group of structures may and should exist, however, nothing yet approaches what "GUTH Venus" has to offer, and I think NASA is now totally aware of this but not willing to forfeit anything unless it is under their terms, and furthermore, accomplished by only their pathetically inefficient achievements, and none the less being solely accredited for absolutely everything. Will,,, NASA has had many (perhaps too many) years of opportunity, plus years worth of excessive resources, benefits and the responsibility to do just that. In this instance they were apparently too involved with other issues (some old, some new) to be bothered with closer looks at the "Magellan" images, and here I come along pointing all this out, a real thorn in their agendas, and to think, a possible embarrassment, a really big-time "O S". What I have asked for (without sufficient response) is this: to receive support necessary so as to have images better analyzed, to perhaps obtain all the "Magellan" raw radar imaging data (at least for the area of "GUTH Venus") and preferably having access and to work with those individuals responsible for the original conversions to the GIF and TIF formats, and then, if at all possible, to having all of this new information published under NASA or at least having a link from their "Magellan imaging archives" so as to obtain further resource momentum and thereby improve our chances of securing another imaging cycle from hopefully a replacement "Magellan-II" or possibly better and sooner from that of a diverted survey mission (such as the up-coming lunar survey project by Japan or how about one of those Mars intended missions). Because I have not been receiving all that much assistance from NASA, nor their moles, I have essentially been on my own for months, and most recently learning about all this HTML format and accomplishing as much as my limited software and I can handle with regard to enlargements and towards producing study/review documentation of the enlargements as being presented here, as taken solely from the original NASA image file. So, I could obviously use a little help, some editing, technical support and hopefully an opportunity to work on any team, and if necessary, one willing and able to extract the remaining information (raw radar imaging data) from NASA. I'll just bet, any time now, Club NASA is going to attempt a claim that they knew all of this all along, and for some yet to be disclosed reasons, they had long ago decided to put off any further research (let us say for 10 or so years) because NASA may have believed we humans here on Earth could not have accepted anything so ultra-realistic as that of the existence of alien life on Venus. Sorry again, but I do not believe that ruse is going to work, at least not on this one.